In 1910, First Lieutenant Benjamin Foulois became one of the U.S. Army Signal Corps’ first pilots after he was assigned the duty of flying the Army’s one and only airplane, a Wright Model A. But there was a minor problem: He’d never flown an airplane before. So he did what any thinking man in his era would do. He sat down and penned a letter to the Wright brothers, asking them for some instructions. Orville Wright wrote back with some tips, after which Foulois went out to the plane and figured it out. Thus it was that Lieutenant Foulois learned to fly by correspondence course. This is not the way we learn to fly anymore. Instead, a student pilot flies with a flight instructor to learn the ropes. But sooner or later, the fledgling aviator must do what Foulois did: Take to the air by him or herself, and return safely to the earth. We call this flight a First Solo. It’s kinda a big deal in the aviation community. Our family, as most of you know, has two student pilots—my son Rio and my Plane Friend Lisa—and they are both rapidly closing in on their first solos. It’s not a competition, at least not to them. They’re mutually supportive; neither of them is as competitive as I am. Still, I’d often wonder as I lay my head down on the pillow at night after a long day: Which one will solo first? Over the last few months, at different times, I placed different bets. For a while it looked like Lisa would solo waaaaaaay before Rio. But then she hit a training plateau and I despaired that she would ever solo. Right after that, Rio hit a rough patch health-wise, mixed with ill weather, and missed a bunch of lessons. And so it went. Back and forth. Back and forth. But as 2018 drew to a close, their mutual flight instructor was telling me that they were both “very close.” They both took their pre-solo exams and both passed with flying colors. I don’t remember a pre-solo exam. I think that must be something new. Well, I guess that given the fact that my solo was well over three decades ago, I can’t be using a word like “new” to describe anything that happened in the interim, but you know what I mean. Actually, having two student pilots in my life has led me to learn no end of things that I’d either forgotten or that have changed without my noticing it. Anyway, Rio was within a flight or two at the most, when a chain of bad weather cancelled several flights in a row. Then Lisa, who teaches at a community college, booked nearly every day of her winter break between semesters to train. This should have put her ahead of weekly-flying Rio, but she must have forgotten to make the proper sacrifice to the winter weather gods, because they fell on her with a vengeance. And it wasn’t just low ceilings, blowing snow, and crappy visibility: One day an ice storm so clogged and blocked the hangar door tracks that, even with a blow torch, the FBO couldn’t reach her plane, Warbler. Then a few days later, they “forgot” to put him in the hangar at night, and he was an Ercoupe popsicle when she showed up to fly the next morning. Meanwhile, in addition to working on his pilot’s license, Rio has been working on his driver’s license. Here in New Mexico we use a complicated “graduated” licensing system. This required him to take driver’s training once a week for several months, then he got a student license that let him sit left seat in a vehicle with a responsible adult while he logged 50 hours of driving time, including 10 hours of night driving—actually not that different from the requirements for flight training. After this “dual” training requirement was completed, he’d qualify for a provisional license, that would basically let him be driver in command, but limit the number of fellow teens he could carry with him to one (excluding sibs). Rio could have had his provisional license some time back, but driving doesn’t interest him much, which I confess I find baffling. I couldn’t wait to drive when I was his age, and I loved the freedom and independence of being behind the wheel. Anyway, before the close of the year, Rio had logged the necessary time, but one thing or another got in the way, and I didn’t get him to the Department of Motor Vehicles until after the first of the year. It was surprisingly painless until the next stop at State Farm, where I discovered having a teenage son doubled my monthly auto insurance bill. On this same day, Lisa, who hadn’t been flying in about a week due to the anger of the weather gods I was talking about a moment ago, was off to Santa Fe. It was cloudy, but the ceiling wasn’t too low. The week before her instructor had told her, that if she felt ready, he would endorse her for her first solo after the next flight or two. As she hadn’t flown for a bit, I assumed it would be the next day, but when I looked at the forecast, I guessed that the next day would be unflyable. I worried her solo would be pushed back. But speaking of solos, I suddenly realized that Rio, despite being a licensed driver for nearly 20 hours, had never soloed a car. So I sent him out for a pack of cigarettes. Well, not really, of course. I don’t smoke cigarettes any more, nor will stores sell them to minors—but the proverbial cig run was just what he needed. I handed him the keys and dispatched him up the road to Romeroville, about 15 miles up the highway from our house, with instructions to go and buy whatever struck his fancy, then I busied myself around the house and pretended not to worry for the next hour. He returned, unscathed, with a bag of Nacho Cheese Doritos, and reported that he had fully expected to be a nervous wreck, but that in fact, things had gone well and he found himself not only relaxed, but more focused on his driving than ever before. Which got me wondering why a first solo isn’t part of driver’s training early on. Surely, the confidence gained, and the focus on individual responsibility early in driver’s training would be beneficial. I mean, it’s crazy, we give driver’s licenses to people who’ve never even once driven a vehicle by themselves! Speaking of when to solo, back in the early days of aviation, solos happened very quickly in pilot training; after only a few hours. In my day, not quite so quickly. Looking at my logbook I had about 25 hours, and as I recall that was on the long side at the time. I must have been a poor student. But nowadays, it’s not uncommon for students to have nearly enough hours to legally get their licenses before the solo. Partly there’s more to learn. Flying and the flying environment have become more complex over the decades, but largely it’s the regs and how the regs are interrupted. 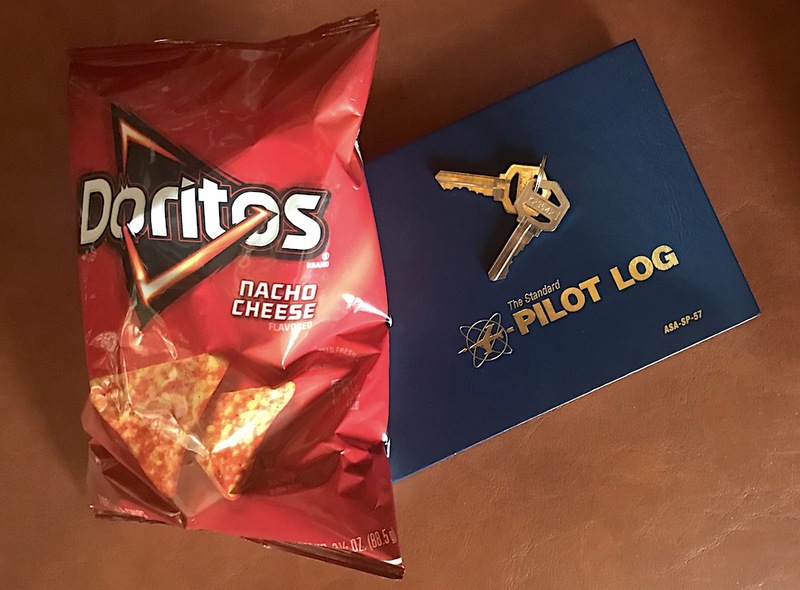 Frankly, I think pilots advanced more quickly in the old days with earlier solos, but I digress. Anyway, in the middle of being proud of Rio, and talking to him about his solo drive, my phone made the teletype clattering that signaled a message from Lisa. It read: Need a stiff drink. Can you help? She gave him a big hug, and told him, “I’m sorry, Rio… I soloed first!” Then she laughed and she tickled him. Yep. Lisa had taken to the air by herself and returned safely to the earth. Three times. Complete with three other airplanes in the pattern and a landing commuter jet. And like Rio on his drive, she reported no nerves. “I knew I could do it,” she said, “and I did.” Simple as that. Was Rio the least bit bothered that she beat him into the air? No, he’s just not that kind of kid. He was just happy for her. But in truth, she really didn’t solo first. They both soloed on the same day, at pretty much the same time. Lisa in an airplane. Rio in a jeep. This entry was posted in First Flights, Plane Awesome, Plane People, Plane School by admin. Bookmark the permalink.